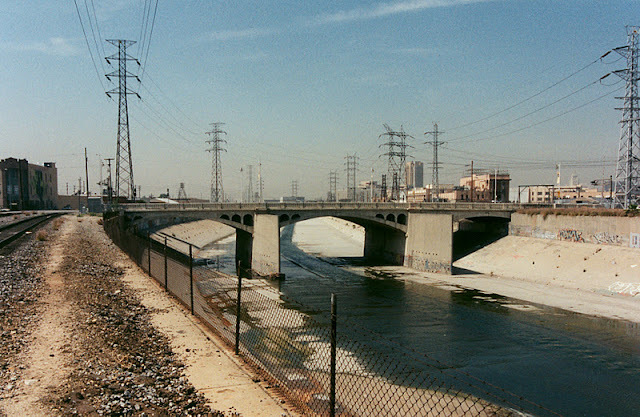 The Los Angeles River currently flows east for about 40 miles along the north side of the Santa Monica Mountains and then turns south for another 40 miles until it empties into San Pedro Bay. As the river approaches downtown Los Angeles it's crossed by ten old arch bridges. I was hoping that since today is Cesar Chavez's birthday, I would be able to discuss the bridge that bears his name. However, the next bridge downstream is North Main Street, a reinforced concrete deck arch built in 1910 by Carl Leonhardt and H.G. Parker. It is a three span, open spandrel arch, 300 ft (91 m) long and 56 ft (17 m) wide. It's in an industrial area with railway tracks and transmission towers on both sides of the river. The bridge has two pier walls in the river with large cutwaters to protect it during floods. It would be interesting (but maybe dangerous) to see this river running full. The bridge has been here for 100 years, so apparently the cutwaters are doing a good job. Los Angeles River Bridges: North Main Street Bridge by Mark Yashinsky is licensed under a Creative Commons Attribution-NonCommercial-ShareAlike 3.0 United States License.